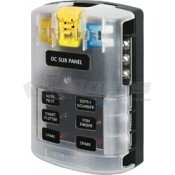 Most functions of your RV rely on DC power; that power must be managed. That is where the distribution panels come in. The distribution panel in your RV is a dual function device. The first function that the distribution panel completes is its job as a fuse box. Much like your fuse box at home, the distribution panel in your RV contains a fuse panel that centralizes all of the dc fuses. 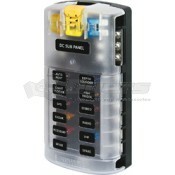 Having all of the fuses in one central location simplifies power management as well as diagnosis of any power issues. 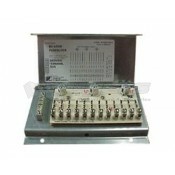 Most distribution panels come with an easy to read chart with all fuses listed. The second function of the distribution panel is to house the power converter. The power converter in the distribution panel takes 120 VAC power from your campground and translates it into 12 volt DC power to supply electricity to the distribution panel. The power converter also provides up to 14.6 volts to the main RV battery to facilitate charging of the battery. Dyers online provides a variety of distribution panels from Parallax Power Supply, Progressive Dynamics and WFCO. The power converters come in both black and brown to fit in with the décor of your RV. 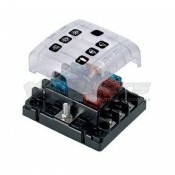 In addition to color choices, you have the option to choose from a variety of power requirements. 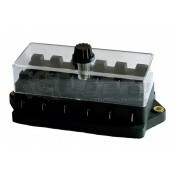 For lower power needs in a small RV we have 12 amp distribution panels as well as 90 amp models for the largest of RVs. For maximum aesthetic appeal our distribution panels feature main doors that cover the fuse panel and fuse guide. For most models, below the fuse panel door there is a vent where the power converter is located. The power converter generates heat and must be cooled with a fan and therefore needs a vent. Some models of distribution panels are vertically compacted, placing the power converter directly behind the fuse panel. In these models the fan is on the face of the fuse panel and the fuse panel door is vented. If you need a smaller vertical profile, these models from WFCO are the best option.